Notes: Based on the manga "Kodomo no Omocha" by Obana Miho, released by TokyoPop in North America as Kodocha: Sana's Stage. FUNimation's license is only for the first season. They've chosen not to license any more of it as of this time. Kurata Sana is a frenetic eleven-year-old child actress with an extremely overprotective agent, a mother who is an eccentric award-winning author, and a burning desire to do well in school. However, as much as she wants to be a good student, the antics of the boys in her class make learning impossible, according to Sana anyway. And in her eyes, Hayama Akito is the worst offender of them all. A junior-high war of the sexes ensues...and Sana eventually realizes through the chaos that Hayama may not be the "devil boy" she's made him up to be. 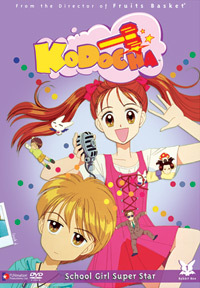 Kodocha has been often described as Marmalade Boy on acid. It is at once silly and touching, with many a scene of utter chaos interspersed with all the pure emotion of a good melodrama, with jumbled relationships crammed together with zany situations and characters. And we haven't even left the house. The silliness continues at school, with the junior high boys blackmailing the teachers so they can keep the status quo: general chaos, of course. When Sana-chan tries to intervene, the results are clever and hilarious, while at times quite touching, as they learn slowly how to deal with each other as human beings rather than as the "evil" opposite genders. Not to mention the crazy children's show Sana stars in (conveniently named - what else - "Kodomo no Omocha"), complete with Zenjirou, a parody on the too-wacky hosts of real-life Japanese variety shows. At the opposite end of the spectrum is the put upon Hayama Akito, the ultimate straight man surrounded by raving maniacs. Though even he may occasionally instigate a few acts of senseless weirdness to alleviate his boredom, he is everything Sana *doesn't* think he is. When you see the ears and tail pop up though, he's about to do something sneaky. Still, Hayama hardly deserves the label of "devil boy", especially given his home life. This is where the story gets dead serious - the storyline often discusses very hard-hitting themes such as child abuse, divorced parents, teenage pregnancy, homelessness, and adoption. It's not all fun and games for Sana and her friends, and often, Sana's mischief is the only thing keeping the series and its characters from spiraling into depression. Thankfully, it hasn't yet, and probably never will. That's for the best. The art is ultra-cutesy, big-eyed shoujo style that may induce sugar-shock in the unwary, much like Marmalade Boy (which the anime and manga closely resemble, not to mention that the manga both ran in Ribbon magazine), and the animation is brightly colored and pretty typical quality for television. But the frenzied comedy is the selling point of this anime, and sell it does. And it's really not a surprise, as the people who worked on the anime were also responsible for the ultra-psychotic Elf Princess Rane. Even people who dislike Marmalade Boy and Fushigi Yuugi may very well enjoy this romp through Sana-chan's junior high world. Recommended Audience: Very little objectionable to speak of. Some of the issues brought up during the course of the series may prompt some discussion with younger children (particularly themes of child abuse and teen pregnancy), but on the whole, it's fun, crazy fare fit for the whole family, barring perhaps only fans of the Teletubbies.